Wilf celebrated seventy-seven years as an altar server on Christmas Day 2017. 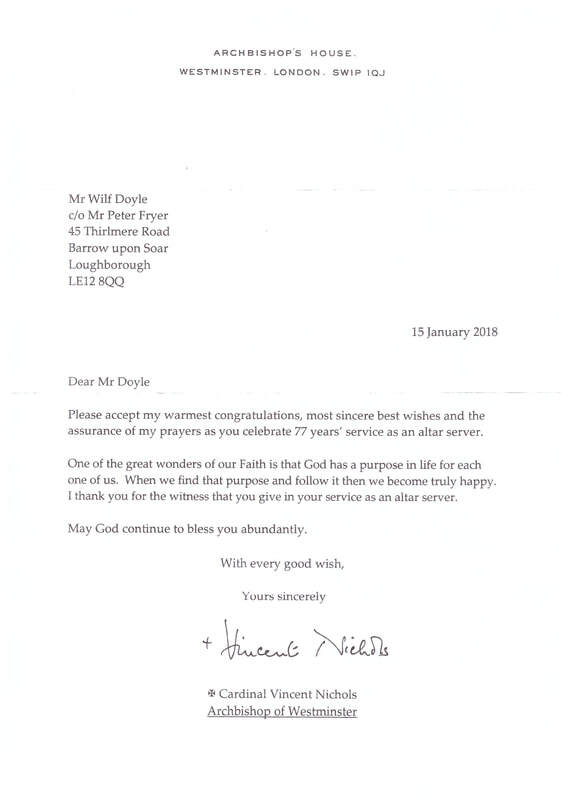 He received well-deserved letters of thanks and congratulations from both Bishop Patrick McKinney and Cardinal Vincent Nichols as well as from the National Director of the Guild of St. Stephen. British Olivetti HQ in Berkeley Square: National Chairman for Sport at forty-eight branches. Grand Knight of the Leicester branch of the Knights of St Columba. President of the Leicester Speakers’ Club. Chairman of the Leicestershire branch of the Institute of Packaging. First Chairman of St. Paul’s Catholic Secondary School, Leicester. Chairman of the SPUC Melton & Rutland branch for the last twelve years. Chairman of SPUC Midlands region covering Peterborough, Derbyshire, Lincolnshire, Leicestershire, Rutland, Birmingham and Staffordshire. President of Leicester South Catenian Association. 1st President of the Kirby Muxloe Catenians Circle. 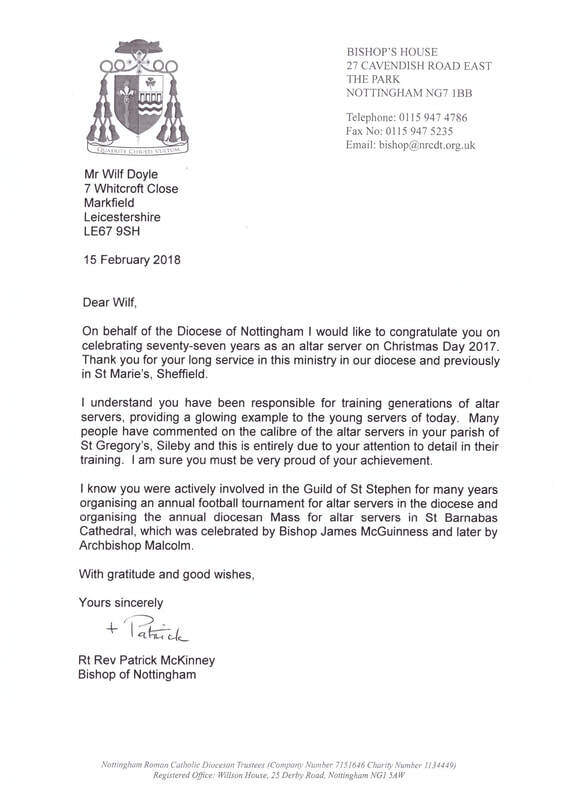 Chairman of the Nottingham Diocese of the Guild of St Stephen of altar servers for over 24 years. Organised a 5-a-side football tournament in Leicester for all servers in the diocese for a period of eighteen years. Up to 410 servers came from as far as New Mills (Derbys. ), Scunthorpe (Lincs. ), Leicestershire and Nottinghamshire. When Wilf gave this up, nobody else came forward to take his place, an indication, perhaps, of the scale of the task. Wilf also organized the annual Altar Servers’ Mass each October at St Barnabas Cathedral, Nottingham, with the Bishop, newly-ordained priests and in excess of 300 altar servers. Immaculate Conception, Oadby, Leicester: Chairman of the Autumn Fayre, organized and ran the raffle. Chairman of social activities (skittles, dances etc. ), in charge of Planned Giving scheme, Catholic Children’s Society boxes for over twenty years. Sacred Heart & St Margaret Mary, Leicester: Chairman of St. Margaret’s committee, tombola stall, social activities. Chairman of Evington Churches Together. MC for over twenty years. Extraordinary Minister of Holy Communion since 1980. St Marie’s Cathedral, Sheffield: altar server for over twenty-two years and MC for sixteen years (in the days of the Latin Mass). 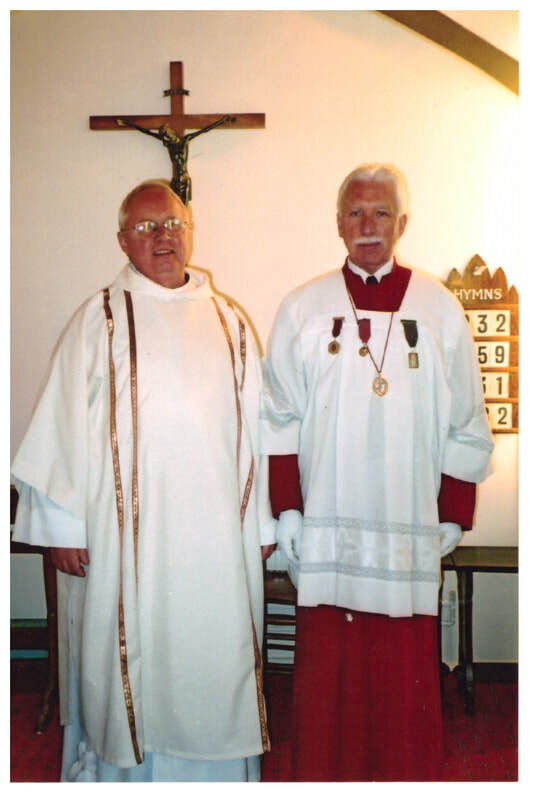 St Gregory’s, Sileby: altar server 1940 – 1942, then returned as MC in 1998 until the present. Smarties fund-raising scheme. Part-time sacristan. Father Christmas at Christmas Fayre. A similar article to those below appeared in the March 2016 edition of The Catholic News. During the early months of the Second World War, Wilf was evacuated from his native Sheffield and went to live in rural Leicestershire. He started serving on the altar at St. Gregory and Saint Alban’s in Sileby during 1940. He must have proved to be a bit too much for the rural community, because after a couple of years they shipped him back to Sheffield where he continued his ministry at St. Marie’s, now the cathedral of the Hallam Diocese. In 1945 Wilf was enrolled in the Guild of St. Stephen and remained at St. Marie’s for twenty-two years. In 1964 he moved to Leicester and served at the Immaculate Conception until 1984 when he moved to Markfield and became M.C. at the Sacred Heart in Leicester. He remained there until 1998 when he moved back to the church where he had served fifty-eight years earlier. 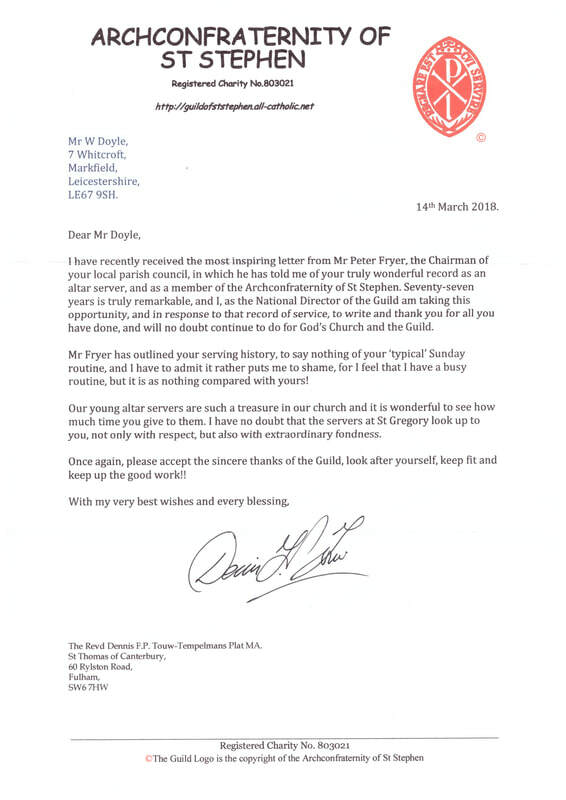 Since then he has been responsible for training generations of altar servers, providing a glowing example to the young servers of today, apart from the fact that he is a Sheffield United season ticket holder and a purveyor of toe-curling jokes. 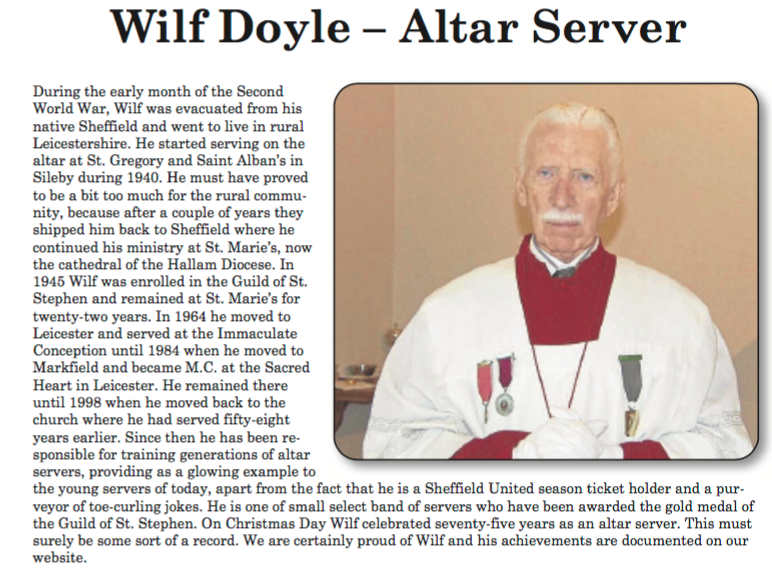 He is one of small select band of servers who have been awarded the gold medal of the Guild of St. Stephen. 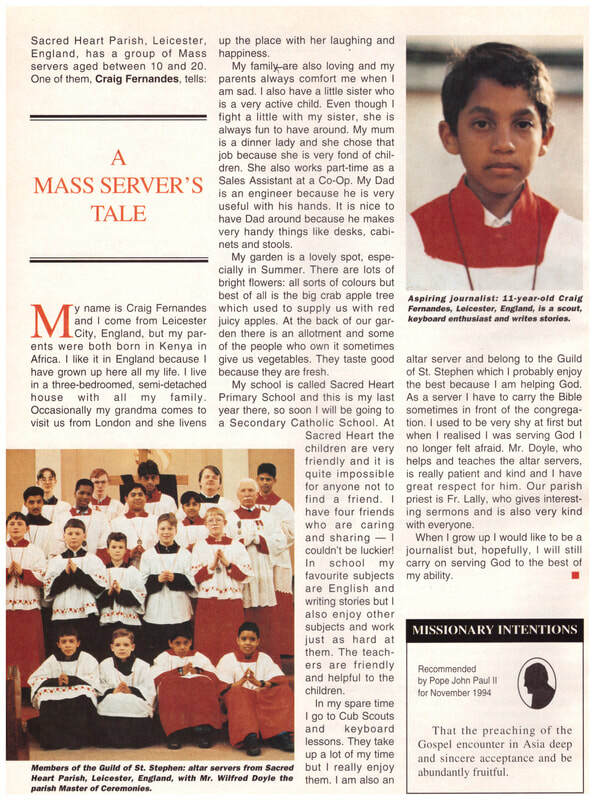 The article below appeared in the November 1994 edition of "Africa", the magazine of St. Patrick's Missions, when Wilf was Master of Ceremonies at the Sacred Heart Parish in Leicester.